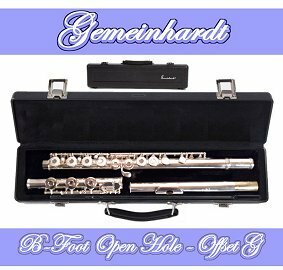 Gemeinhardt Model 3OB Offset G Open Hole Flute Rental Description: Flute Specs: Key of C, Open Hole Hole, Low B Foot, Offset G, Silver Plated. Accessories: Hardshell Flute Case, Flute Cleaning Rod and Flute Care and Maintenance Kit. The Gemeinhardt Model 3OB Offset G Silver Plated Open Hole Key of C Flute with Low B Foot is great for any grade or high school flute student. The Gemeinhardt Model 3OB Offset G Flute is great for any grade or high school flute student in need of a high quality student open hole flute. Gemeinhardt is a well known student flute that student and teachers love. All of our instruments are tech serviced before they ship out to you so they are ready to play right on delivery. Select from 3, 6 or 9 month rental options. Rental goes to monthly billing at the end of the up front rental period you select and you may return at anytime. There is a purchase option with every rental which allows you to apply up to a specific amount of paid rental fees toward the purchase of your instrument. There are economical advantages to paying for a larger block upfront and those options and discounts may be reviewed above. We can ship your Open Hole Flute Rental anywhere in the USA! Order Online Now.